Have you ever seen a ravine on which there is a small village? On one side is a huge abyss, on the other side you will see a forest mixed with tall mushrooms. The inhabitants of this village are cautiously moving along the paths as one of them leads straight to the ravine. Go down into this ravine to get a few stacks of building resources and build your house next to others because this is a great place to start a new life. 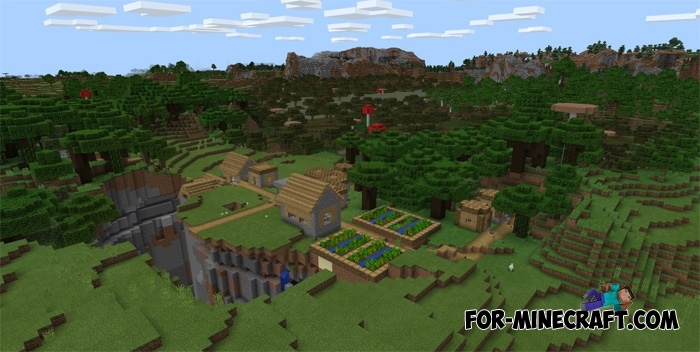 The seed name is very simple and easy to remember: type 1000 and inspect these places, especially if you have never seen ravines in Minecraft 1.2 before. Long Ravine seed (Minecraft 1.2)This seed spawns you near a ravine, but it is not ordinary and surpasses others having a long length..